In a major feat, Chinese scientists have cloned monkeys using the same technique that gave us Dolly the sheep more than two decades ago. 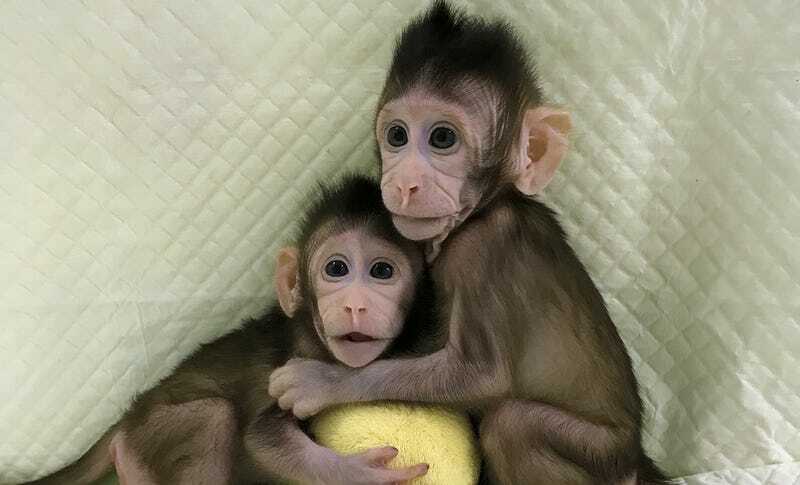 Two identical (and pretty adorable) long-tailed macaques named Zhong Zhong and Hua Hua were born eight and six weeks ago, respectively. They are the first primates to be cloned from a non-embryonic cell. Many mammals, including dogs, horses, and rabbits, have been cloned since Dolly was born in 1996, but the new research, published Wednesday in the journal Cell, is significant because monkeys have in the past proved resistant to the cloning technique. Genetically identical animals are useful in research because confounding factors caused by genetic variability in animals can complicate experiments. They could be used to test new drugs for a range of diseases before clinical use. Cloned animals could also help scientists better hunt for genetic links to diseases. Researchers at the Chinese Academy of Sciences Institute of Neuroscience in Shanghai used a process called somatic cell nuclear transfer to transfer the nucleus of a cell into an egg which had its nucleus removed. The Chinese scientists seem to have succeeded where others have failed by switching on and off genes that were interfering with the development of the cloned embryo. Even in spite of that, the success rate was extremely low: It took 127 eggs to produce just two baby macaques. It was also only successful in transferring nuclei from fetal cells, not adult cells like the ones Dolly was cloned from. Recently, China has been at the cutting edge of much biomedical research. It has already used CRISPR to treat upwards of 86 people for various diseases, while the U.S. is only just beginning its first human CRISPR trial. Last year, China was also slated to host the first human head transplant, though there has been no news of whether that experiment transpired. A major reason for China’s dominance in this area is the lack of the strict safety regulations that constrain U.S. researchers. The successful cloning of a primate is sure to stoke fears that cloned human beings are around the corner. Is Eating Synthetic Human Flesh Cannibalism? If You Transplant a Human Head, Where Do You Get the Body?